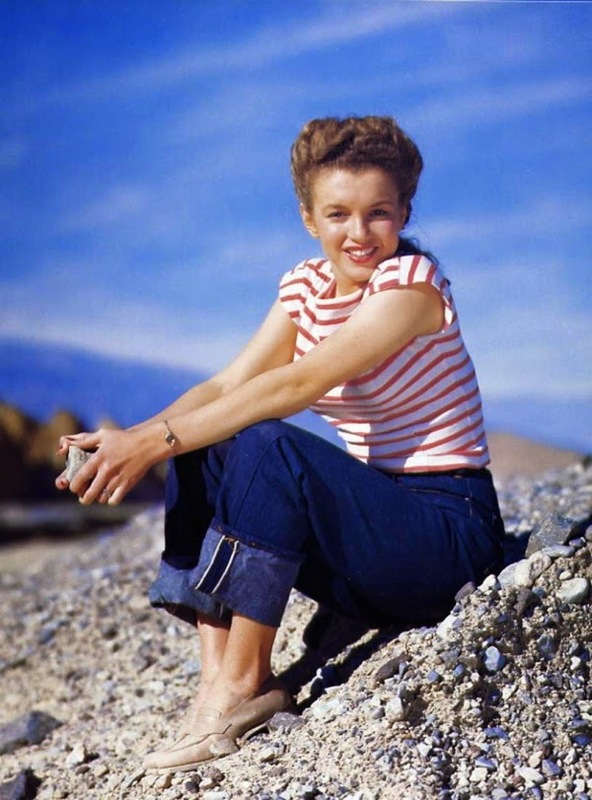 Ah, the off-duty staple of many a Hollywood starlet's wardrobe from vintage decades until now, the striped Breton top and jeans! There's a reason this look has stood the test of time - it's dressed down, but stripes always sharpen a look. It's chic and incredibly wearable. In the slighter warmer months, it's my at-home uniform. If I'm doing housework I wear an old pair of Levi's with a turn up, and if I'm relaxing (and not doing anything to get dirty, like scrubbing or gardening!) I might wear my Bernie Dexter jeans. The other day I styled mine with a nod to the 1950s, with cat eye sunglasses, red lippy and turn ups. You might also notice I'm sporting a lovely red 'batchel' from the Cambridge Satchel Company - I won it! Pago, the fruit juice company, held a competition to style an outfit to represent one of their flavours. I dressed to represent their tomato juice, and I was absolutely delighted to be one of five winners. You can see the other winners and the entries on the Pago Facebook page. Red 'Batchel', Cambridge Satchel Company - prize via Pago fruit juice competition! The Levi's are too short in the leg for me, and slightly flared, hence the conversion into turn-ups! I have found that Levi's are one of the only brands of jeans that actually fit me and my figure that...how can I put this? Has a little more junk in the trunk?! Modern jeans are too low-rise, cutting painfully across my hip bones, as well as flattening my derriere and straining across my thighs. My Baby thinks this pair of jeans is the sexiest piece of clothing I own, and is like a Wonderbra for buttocks! Now here's how the starlets did it in their bretons and jeans: Bardot, Monroe and Seberg. They are all so fabulous! Do you wear a breton and jeans? What do you think of this classic look? 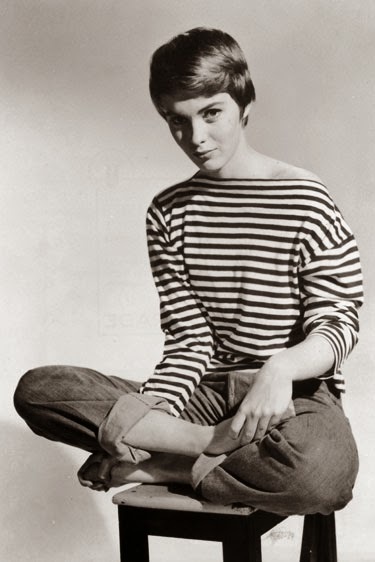 I haven't worn jeans in absolutely years, but I do love Breton tops. I have a slightly cropped one but always think I should pick up a longer one but each time I find one I talk myself out of it again! The last jeans I had, I loved, they were flares and I wore them until they fell apart and then I moved on to bootleg cords but after seeing one too many photos of me looking far too big in the hip area, stopped in my tracks! I most definitely do! It's a wardrobe staple for me. Buying jeans is such a nightmare though, I hate low rise jeans anyway but I have a long torso so that tends to make most pairs low rise on me :-( I have found a neat trick is to buy jeans with a 'short' leg length and I instantly have 3/4 length trousers. I haven't owned a pair of jeans in about 20 years. I do like them on some other people - as with any clothes, it depends on the wearwe and how they wear them. This casual look is perfection! Loving your eye for style! Second: you look fabulous, channeling the Brigitte-feel out from the screen. And last: the bag is adorable. All in all: you are one lucky lady, dear. wow how amazing that you won that absolutely beautiful bag!!! and i have to agree with the girl above me you are definitely a second brigitte bardot in that outfit! amazing!!! hope you have a wonderful sunday evening! This is the perfect at-home outfit - relaxed and casual, but still classy and put together. I love all your inspiration photos! Great casual look, adore the bag! How wonderfully exciting!!! Many happy congrats on your awesome win, dear gal. After a long, grey winter, one needs a vibrant handbag/satchel like that to help usher in spring with. Thank you sooooooooooo much for linking and sharing your wonderful style with us. I am considering buying my first ever pair of jeans and may try Levis. I have a similar figure to you! I recently started to wear trousers after being a skirts/dresses only person and now wish I had done so many years ago. They are so versatile and comfy! A timeless look, indeed. And that satchel is AMAZING!!! The fact that you won it just makes it more incredible.